School Fundraising with Little Passports! Mix things up with Little Passports Fundraising at your child's school! Are you a PTA member (or similar parent/teacher group) at your child's school? Have an upcoming fundraiser to plan but don't want the same copy-cat catalog? Surprise everyone... Shake things up a bit this year and give Little Passports Fundraising a try. Partner with a wonderful award-winning product thats not only educational but a favorite for kids as well as parents! Discover the world in your own home and be amazed! Little Passports offer multiple monthly shipment options in USA & World Edition. Kids of all ages are sure to have tons of fun & get the opportunity to learn amazing facts, play games and get creative with educational art projects! Learning through play, a parents' best friend!! How things works: You'll receive flyer(s) to help spread the word about your school's fundraiser to all! Friends, family and neighbors shop at Little Passports and your child's school will receive 15% of profits! Walmart Savings!! - Suave Deodorant Twin Packs! Stock up on deodorant with Suave Twin Packs at Walmart!! For both Women and Men!! $5 or less!!!! I recently had the opportunity to try out a bottle of Sally Hansen - Triple Shine Fingernail Polish in the shade: "Dive In" (A turquoise color) and was truly surprised. It arrived inside of my Influenser #VioletVoxBox, among many other goodies that I couldn't wait to try out. I ended up being in the middle of packing & moving when the VoxBox arrived and it took a couple extra days before I was even able to test out the polish, but it was worth the wait, for sure. I'd heard of Triple Shine before but never had the opportunity to try any out until now. At first glace, I wasn't too sure about the color, but once I saw it on my nails, I had no more doubts. "Dive In" must stand for Turquoise in the land of Sally Hansen, and I absolutely love it! Triple Shine Polish gives you a solid layer of color with just one simple coat, add a second coat and it looks even better! Not to mention the incredible shine that could easily pass for a clear coat. No joke, this polish can honestly cut your nail session time in half! Which leaves more time for MMA and dance class - or any other activity that your family may be interested in. I can't promise that you won't chip a nail though... that situation is almost impossible to avoid. I've been wearing my new polish for a few weeks and I'm surprised at how well the polish has survived my crazy life. I don't often get a chance to paint my nails but I'd choose color over dull & natural any day! I plan to pick up a couple more bottles from the Triple Shine line very soon. Sally Hansen Triple Shine nail polish is a new member of my favorite beauty supplies list! Try it out for yourself and I'm sure you'll feel the same way. 3 cheers for a quicker beauty! Sally Hansen - Triple Shine Fingernail Polish receives an "A" grade from My Kind Of Introduction. Learn more about Sally Hansen Triple Shine nail polish by visiting the Sally Hansen website or purchase online via the links below. And Target online as well! Disclaimer: I received the products mentioned above, complimentary from Influenser for testing purposes. -- This blog accepts compensation in the form of products and/or monetary for selected posts which will be labeled as sponsored. No matter the compensation, I only write about items and/or services that I have personal experience with and believe my readers will enjoy and/or benefit from. All opinions are my own and may differ from those of others. View Full Disclosure for further details. Start out 2014 with a step in a healthier direction! I know I'm a bit late with the New Years greetings but better late then never right?! I hope everyone has had a wonderful beginning to 2014, mine has been pretty decent, especially when you factor in our current living situation, which is a bit stressful at times. Yes, it gets hectic at times but I'm extremely grateful to have such wonderful friends. Now that it's 2014, it's time to set up some goals so you can keep all of those New Year Resolutions that you made. If you plan on exploring a healthier lifestyle then I highly recommend trying out All Natural SoyJoy bars. With just 6 grams of fat, SoyJoy bars are extremely healthy and surprising delicious. When I realized that my #VioletVoxBox was hiding a SoyJoy bar inside, I didn't really know what to think. I'd never ate anything that was made from soy before so I didn't know what to expect of this little Dark Chocolate Cherry SoyJoy bar, but with a flavor combination like that, I had to give it a try. A few nights ago, while waiting on my fiance to get home from work, I got a little hungry and since I didn't want to make a lot of noise in the kitchen with it being 1am, I reached for my Influenser #VioletVoxBox and headed for the SoyJoy bar! When I opened the pack, I was amused to see a slim rectangular bar with visible fruit pieces inside. I took my first bite with caution and even though it had a unique flavor that I wasn't use too, it was yummy! The unique flavor was the soy, which I'd never tried before but was pretty pleased with the taste. Not to mention the combined flavors of chocolate and cherry that added to the yumminess! My taste buds were surprisingly happy and knowing that my after midnight snack was a healthy one, made things even better! SoyJoy bars are baked with ground whole soy as well as real fruit with no artificial colors, flavors, hydrogenated oils or gluten! Amazing right?! I'm not a big healthy eater but I woulld definitely eat another SoyJoy bar - I wouldn't mind tasting a different flavor though, because having variety is a wonderful thing! 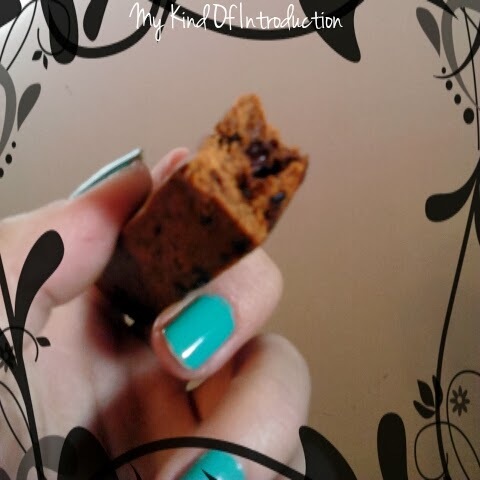 I honestly would of never tried SoyJoy bars if it wasn't for my #VioletVoxBox! They find some of the coolest products to fill those little boxes with!! I love it! Who would of thought that I would end up enjoying the taste of SoyJoy bars? I highly recommend trying one of these awesome lil' bars. Don't let the soy scare you off, I promise that you'll be amazed! Don't know where to find SoyJoy bars? Check them out on the SoyJoy website for more flavors, information and so much more! • I received the product(s) mentioned above, complimentary from Influenser in return for my honest thoughts and opinions. • This blog accepts compensation in the form of products and/or monetary for selected posts which will be labeled as sponsored. No matter the compensation, I only write about items and/or services that I have personal experience with and believe my readers will enjoy and/or benefit from. All opinions are my own and may differ from those of others. View Full Disclosure for further details. This post may contain affiliate links. Meet the SeaBuddies... the new line from NightBuddies! Who can forget those 4 lil' cars whose headlight eyes glow in the dark with a gentle squeeze & helps our little ones drift off to dreamland? If you're a regular at.My Kind Of Introduction, then I'm sure you've seen the NightBuddies on either the blog and/or throughout my l social media accounts. 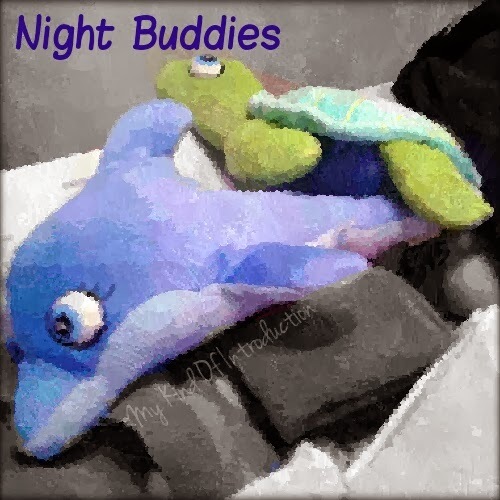 I decorate my blog with NightBuddies often since I can't seem to get enough of their extreme cuteness! And as if the "auto-buddies" weren't cute enough... there's now a whole new line of NightBuddies - appropriately named: SeaBuddies, adding 4 new buddies to family. 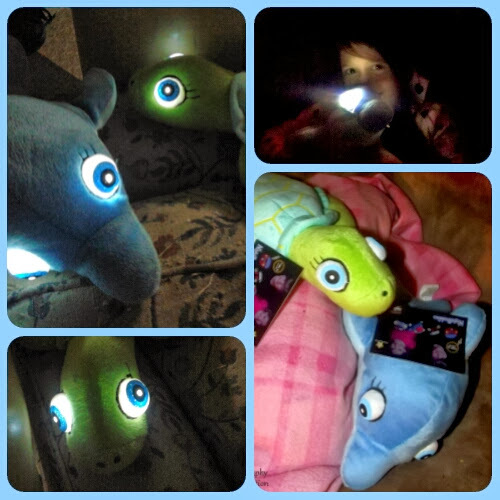 The Sea Life NightBuddies include: a sea turtle, a dolphin, a blue whale and a black & white killer whale. Like the originals, the eyes glow bright with a simple squeeze of their tummies, lighting up the night as a cuddly night-light. Besides having night-light eyes, I love how SeaBuddies are super soft & the perfect size for little arms to cuddle. Did I mention that your child can activate the lights, by squeezing the buddy's belly, as many times as it takes for your little ones to fall asleep?! Pretty awesome, don't you agree? The NightBuddies collection is perfect for any child that prefers an extra bit of light during bedtime. Receiving no less than a "Capital A" for an Amazingly Awesome bedtime cuddle toy!! Learn more about SeaBuddies and the original NightBuddies online! 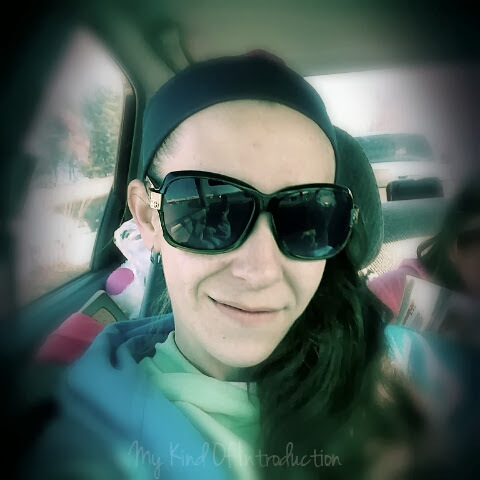 ** All photos and information are property of Autumn Banks & the My Kind Of Introduction blog. ** For more information: Contact Autumn at AutoFaerie@gmail.com -- Thank you for your time & support! I am ME because of YOU!! Goody Athletique Headwraps are super comfy and stylishly made to keep "baby hairs" in place with no more slipping or fly-aways!! During my high-school days, I always wore a headband with my "hair knots" & ponytails. Mama never liked those days but they kept the tiny hairs from tickling my face & causing the wind-blown look, which are the exact reasons why I wore them in the first place. But after a while, the back of my ears started hurting so I had to lay the headbands down. I ran across headwraps for the first time about a year or so ago and never looked back! Stiff headbands never stood a chance. I received a Goody Ouchless Headwrap which has an adjustable velcro strap for a perfect fit. I'm amazed by how comfy this headwrap is and that I longer worry about my headwrap slipping off my head, they've thought of it all! Goody Athletique Headwraps come in many styles that are all pretty amazing: From cord wraps to yoga style, your sure to find a headwrap to match your lifesyle. Goody Athletique Headwraps are not only comfortable but stylish as well!! Perfect! Hide bad hair days under Goody Headwraps and go about your day, no matter how active your plans may be. Goody Athletique can handle it all! I couldn't be happier with my new hair accessory, this #VioletVoxBox is awesome! Watch out Headbands, there's a new guy in town who's modern ways are hard to ignore. Visit Goody online for more information. The headband was last seen working as a 'Memory' on a "Remember the 90's" Facebook page. DIY Project: Create Unique Pet Beds using Upcyced Sweaters -- Minimum Sewing Ability Required! Did I mention how simple these pet beds are to create?? Let the kids join in and make a family project day out of it!! • If your using scrap fabric for the stuffing -- Start by cutting the fabric into many small pieces. • Fold the towels to where they are just shy of your desired size, forming the base to your pet bed. Optional - You can also add a layer of scrap stuffing if wanted. • Pin all layers together into an oval-like shape. • Fold in the edges toward the base center and loosely sew into place. • Add your padding to the sweater body (Cotton stuffing or fabric scraps) and sew into place using thick wool thread. • Stuff the sleeves as well and shape themvaround the circular base. • Finish off the bed by sewing and securing everything into place. • You can decorate the bed to either match your home or make it as unique as your furry child! Anything's possible as well as a non-decorated beauty that'll amaze all of your animal loving friends! If you match your thread color with the sweater color then you'll have less to worry about since neatness won't be noticed. Which is perfect for sewing beginners of all ages, including kids! Get Creative and Design your pet a one-of-a-kind bed that'll score owner points in s heartbeat!! No compensation was received for this post! WHAT'S YOUR FAVORITE ACTIVITY TO DO WHEN IT'S TOO COLD FOR OUTDOORS? I've been without internet for a few weeks now and I've fallen dangerously behind on absolutely everything that I can fall behind on! At first I was in panic mode and worried myself into a bad-mood atleast once a day, sometimes more often than that. Being ill all the time done nothing but upset the ones around me which didn't help me out at all. Somehow or another, I started calming down and rarely hit panic mode. Doing my best to keep busy helped out a lot, I'm sure. The Holidays, moving and my girls have kept this brain pretty busy. On the plus side, I've been able to find a few spare minutes to spill my thoughts into my phone, on the notepad. Some of my writings are a bit scrambled and others are blog related (reviews and such) but I figured that since I spent the time to write in the pad, I couldn't just let them sit on my phone and take up space. So on the rare occasions that I'm able to access the web, I'll try and get a post or two live as well as adding the date that the "note" was written :) For example -- The words your reading right this very second are being written at 10:58pm, Sunday night (Jan 5, 2014). Take a look at today's date and you'll notice the difference. I'm not sure how all of this is going to turn out but definitely worth a try :) Feel free to leave comments on the posts with your thoughts on whatever I may be rambling about. Hearing other people's opinions gets my brain working even more!